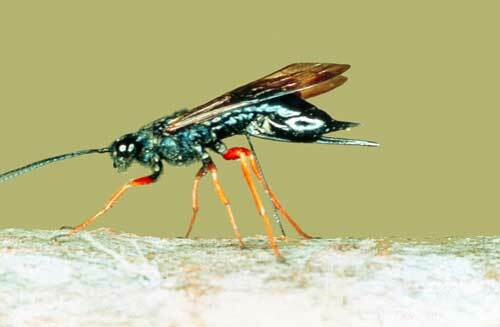 The introduced sirexwood wasp (Sirex noctilo) is one of the most destructive pests of radiata pine. Female wasps drill holes into the outer sapwood of the tree with a saw-like ovipositor at the rear of their abdomen. When depositing eggs into the holes, they also introduce the spores of the symbiotic white rot fungus (Amylostereum areolatum) and a toxic mucus. The fungus and the mucus act together to kill the tree and create a suitable environment for the developing wasp larvae, which feed on the fungus and tunnel through the wood. Unhealthy trees are particularly vulnerable to sirex wasp attack and large numbers of wasps can build up in unthinned plantations.